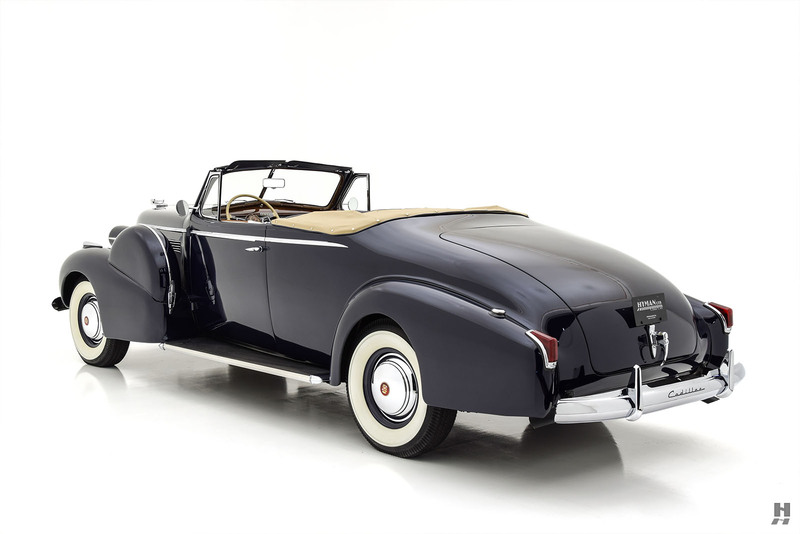 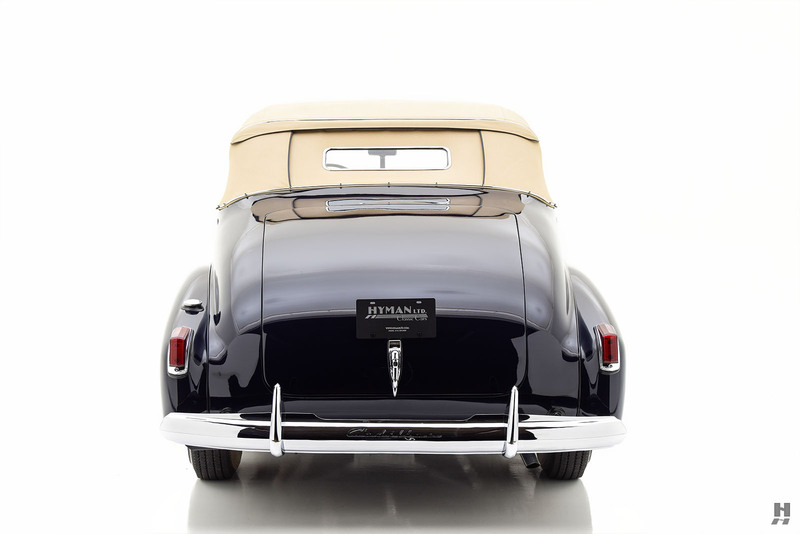 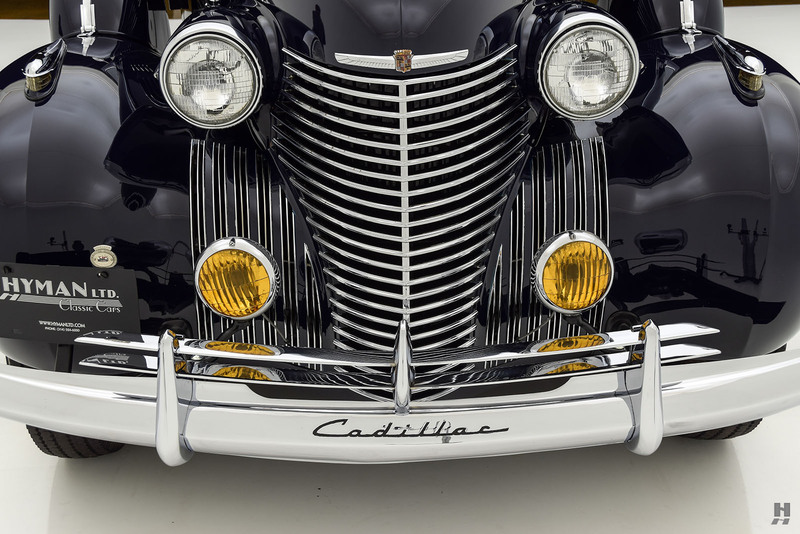 Just as the 1941 models marked the dawn of a new era, the Cadillacs of 1940 represented the final flourish for the marque’s traditional, Classic Era styling. 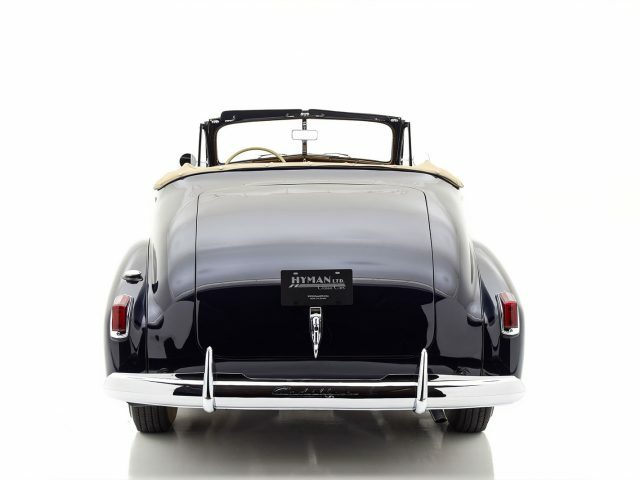 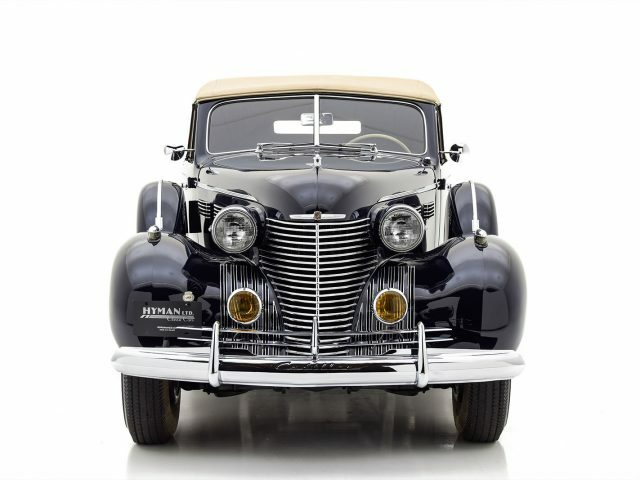 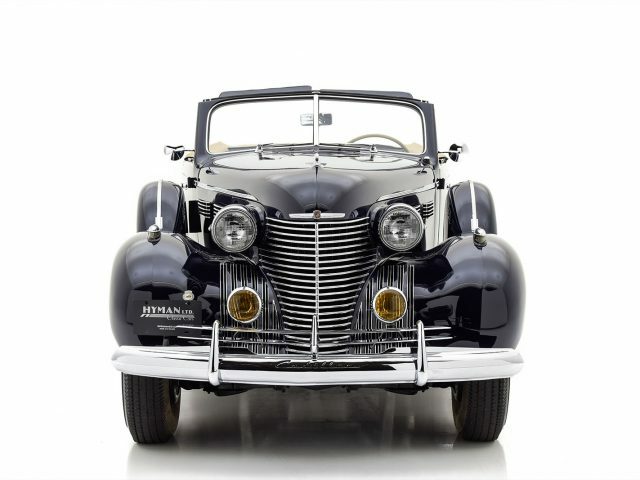 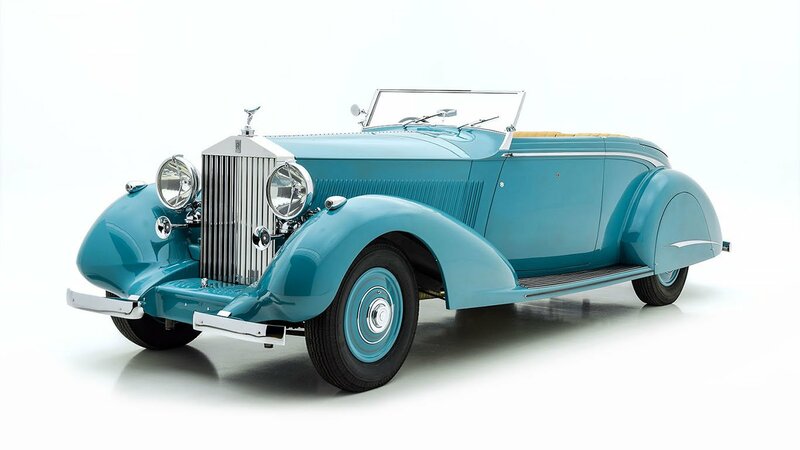 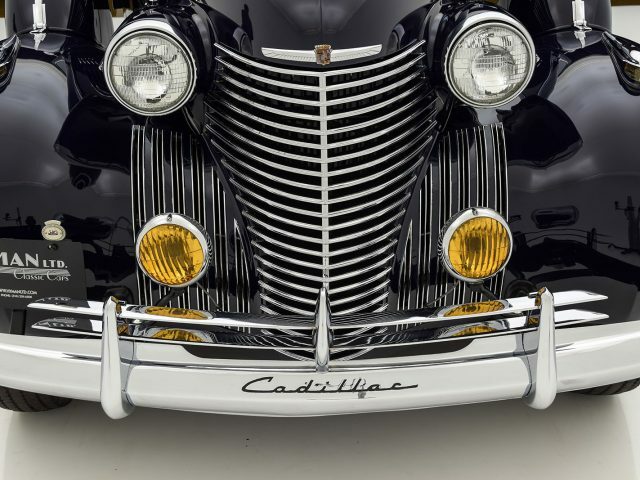 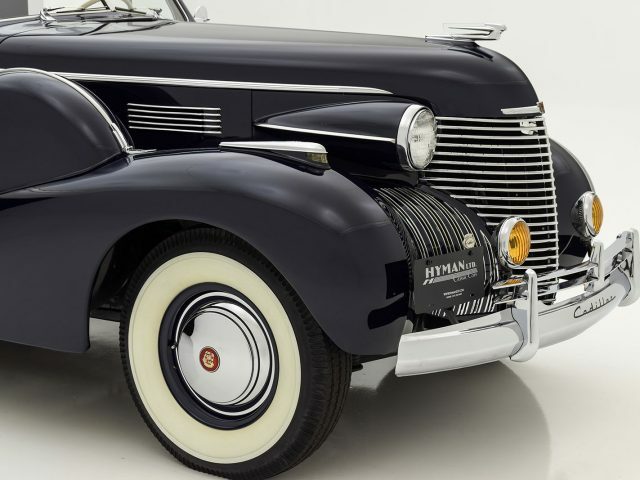 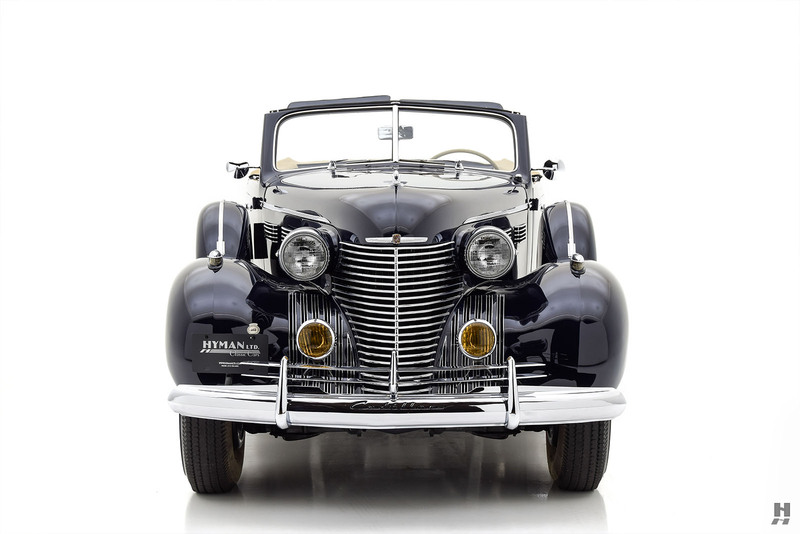 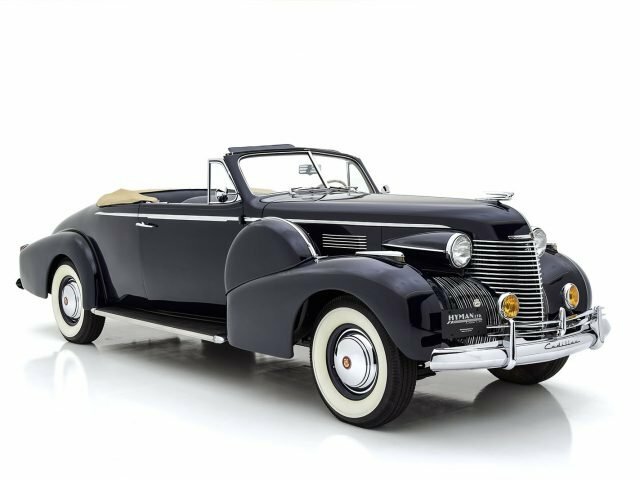 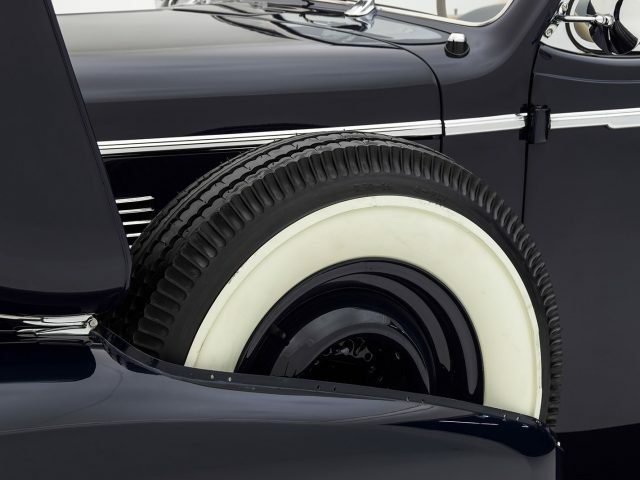 With a completely redesigned model on the way, the 1940 cars were the last to offer the grand, upright grille, separate bullet headlamps, and optional side-mount spare wheels that defined the previous decade of car design. 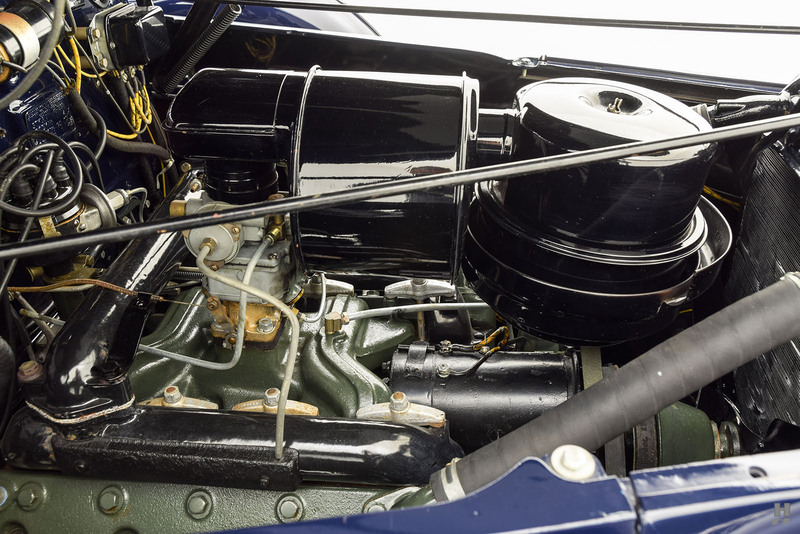 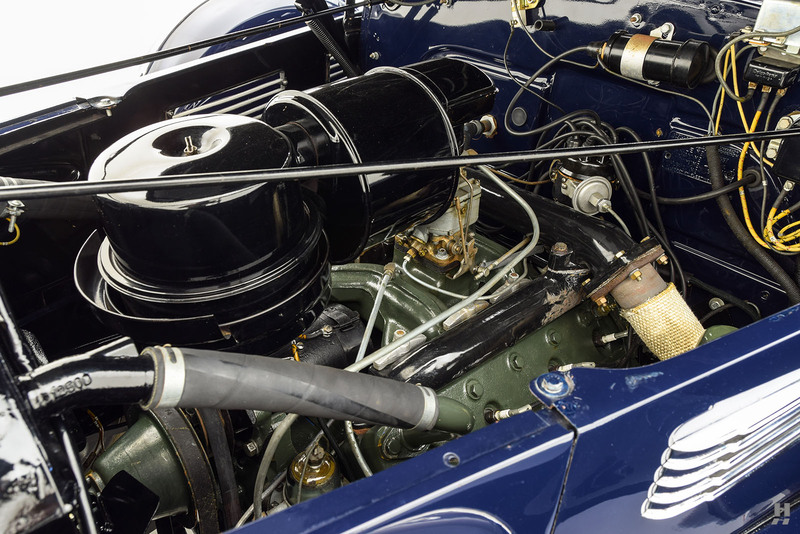 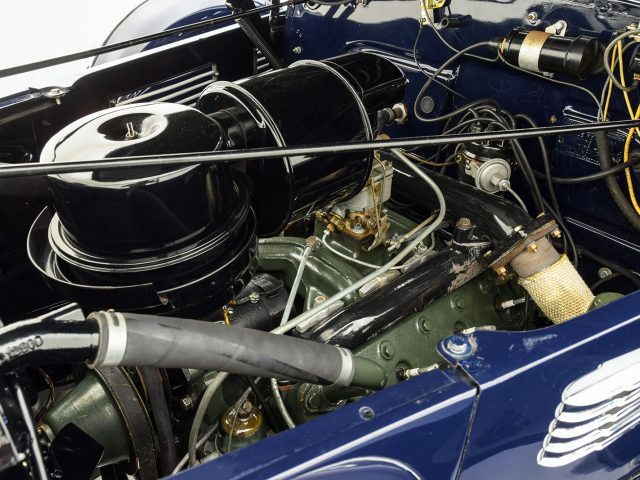 1940 was also the final year that customers could opt for the mighty sixteen-cylinder Series 90. 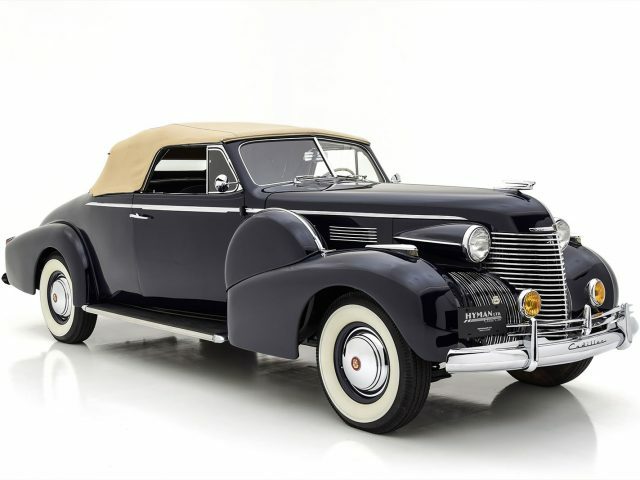 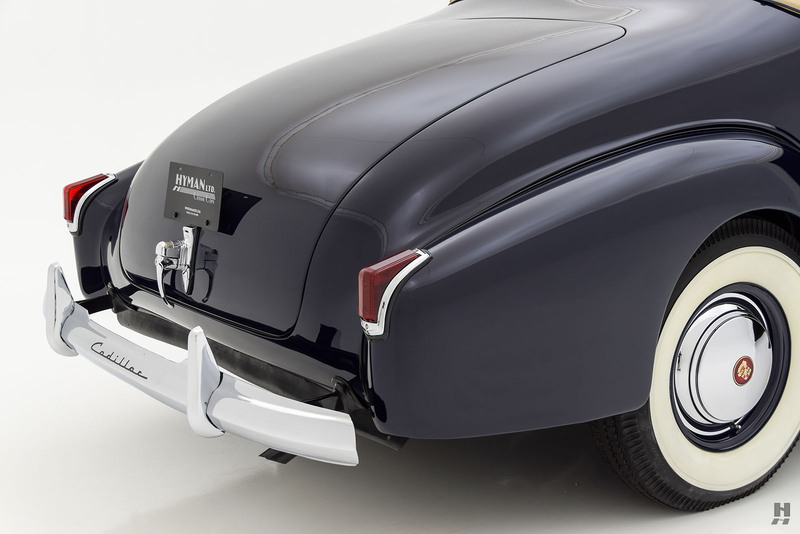 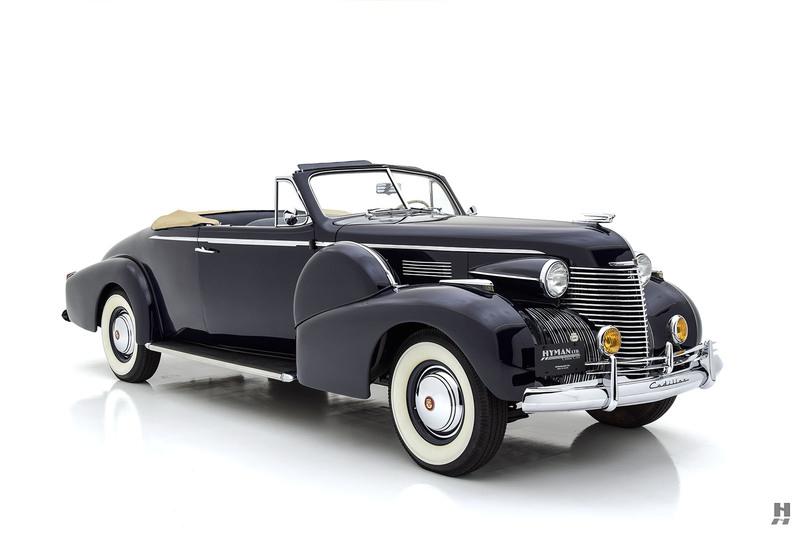 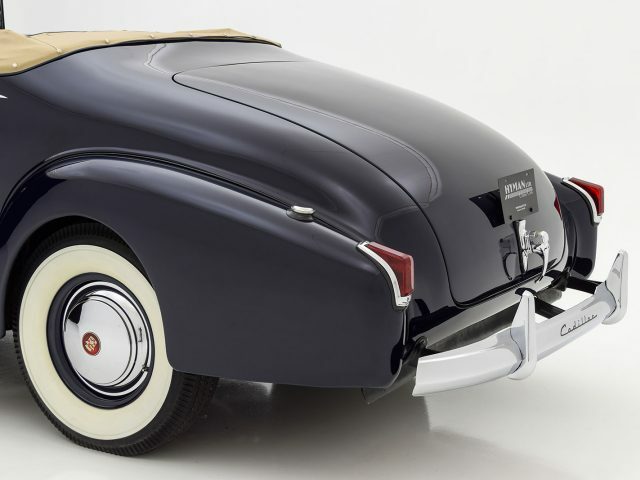 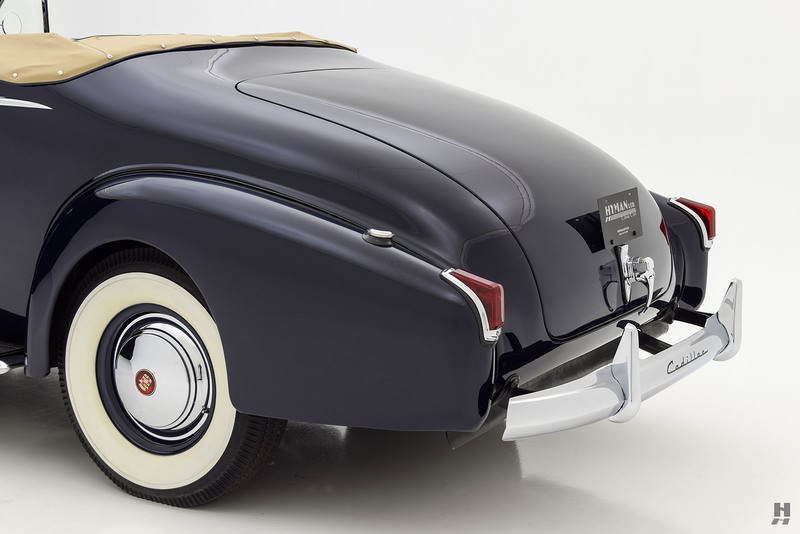 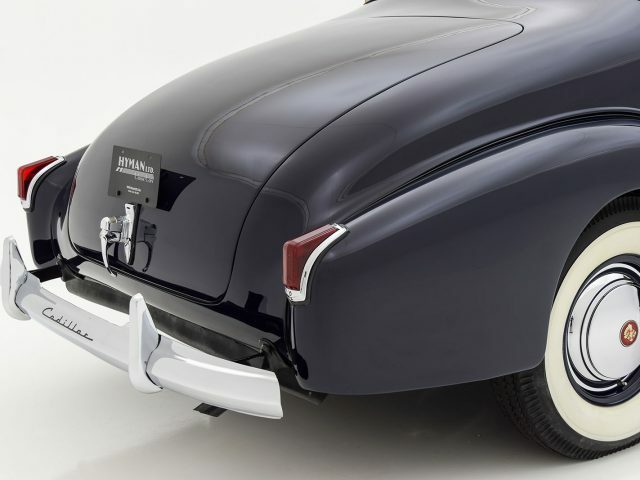 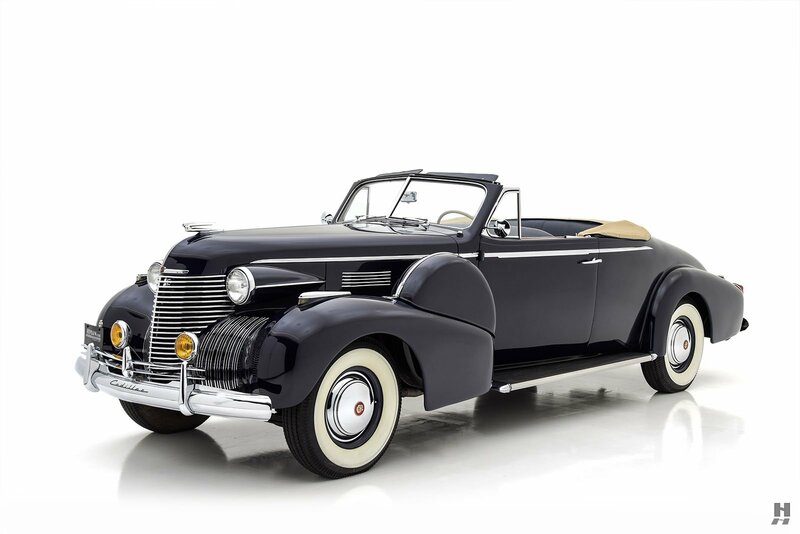 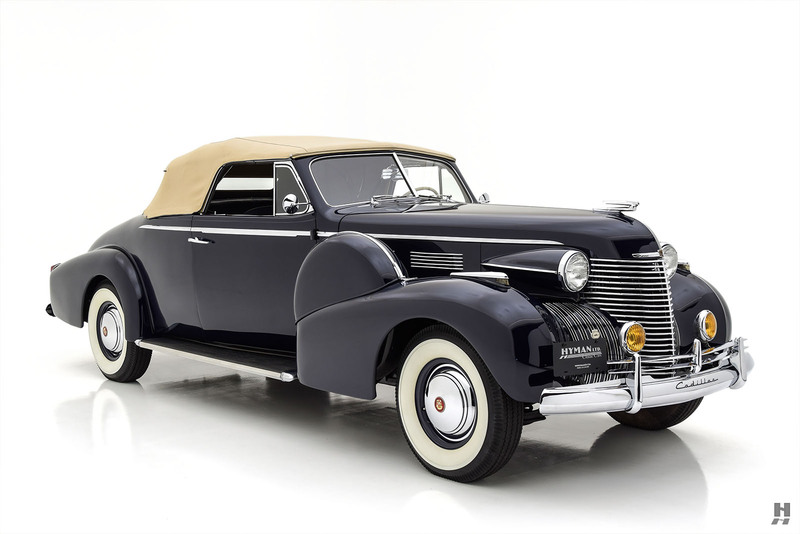 While Harley Earl was soon to introduce a radically new look, the 1940 Cadillac was still a handsome and relevant machine, featuring a balanced design combining traditional themes with modern detailing. 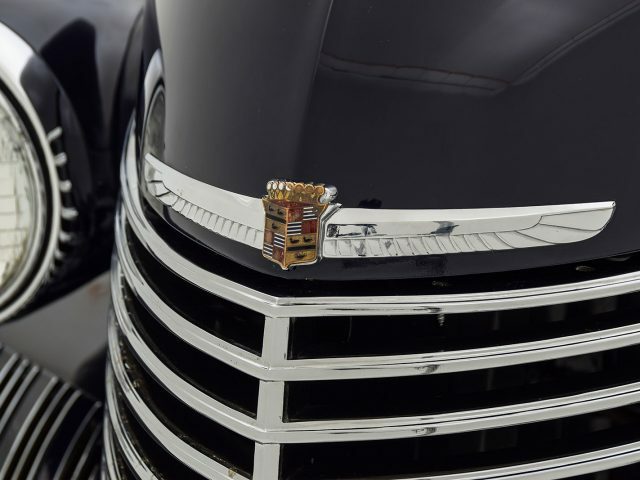 The Series 75 remained as the flagship V8-powered model, sharing the same massive 141-inch wheelbase chassis with the V16, as well as most of the same luxurious bodies from the Fleetwood catalog. 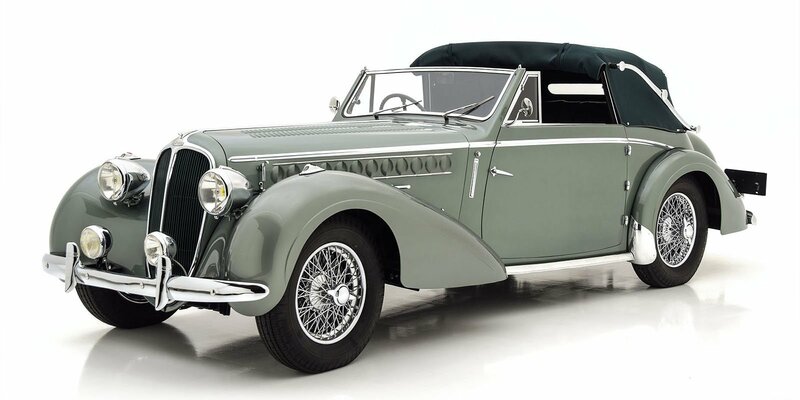 The Series 75 was available in twelve different body styles, each hand-crafted by the expert coachbuilders at Fleetwood. Cadillac/LaSalle sales totaled nearly 40,000 cars in 1940. 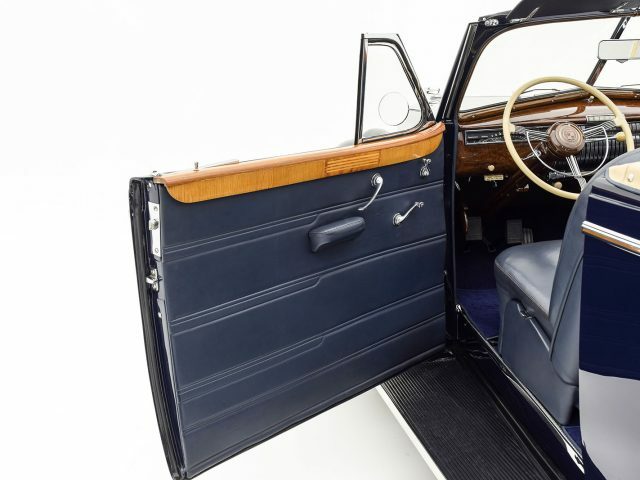 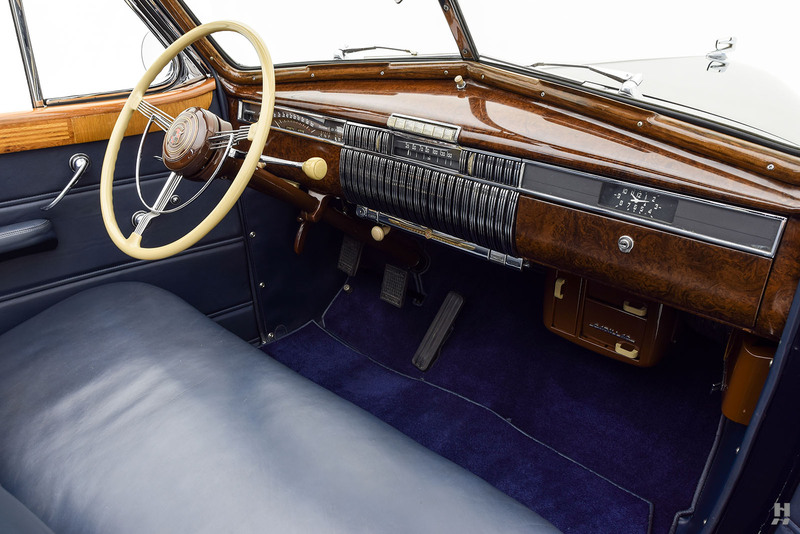 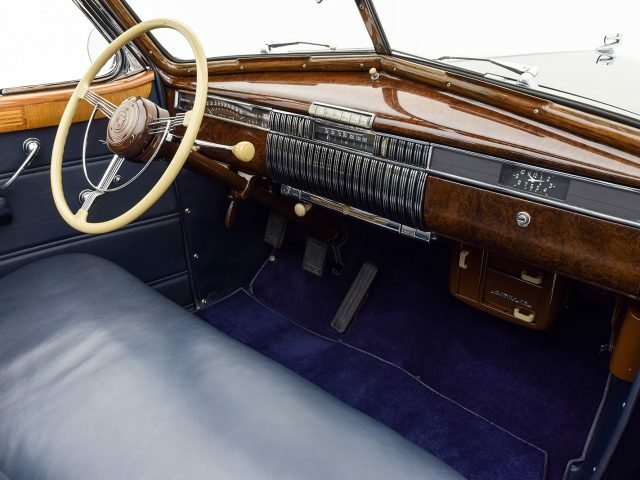 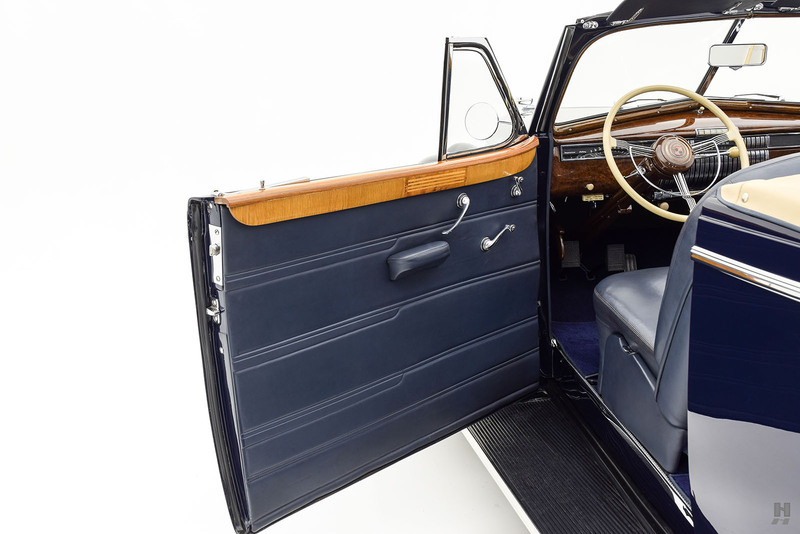 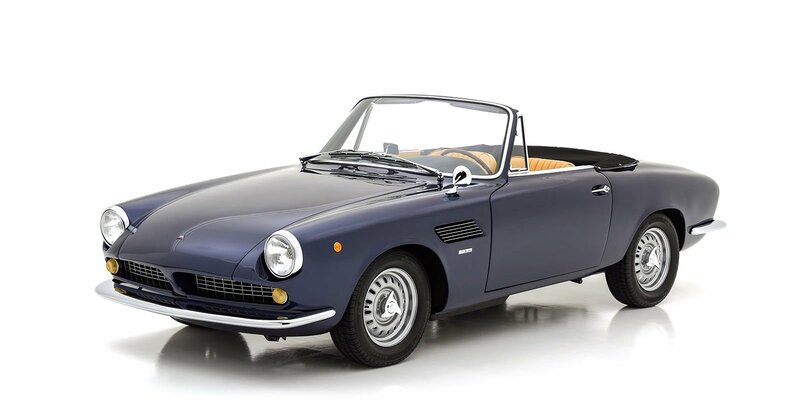 That LaSalle sales made up the bulk of that number reflected the market conditions of the day – the era of the expensive, coachbuilt classic car was nearing its end. 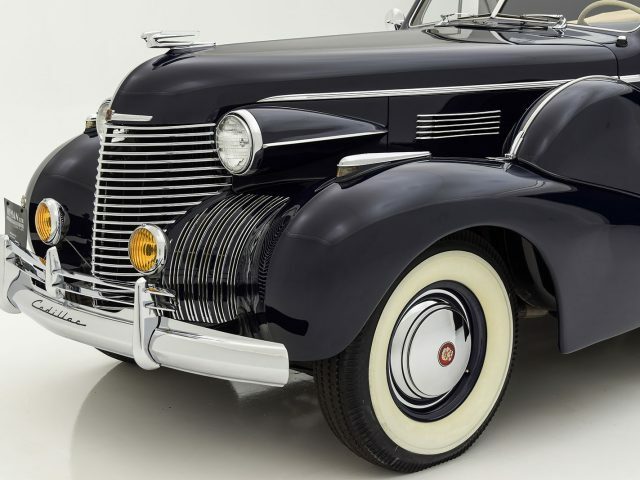 It was no longer financially viable for Cadillac to offer a full range of custom coachbuilt automobiles, and the shift toward a completely standardized range was well underway. 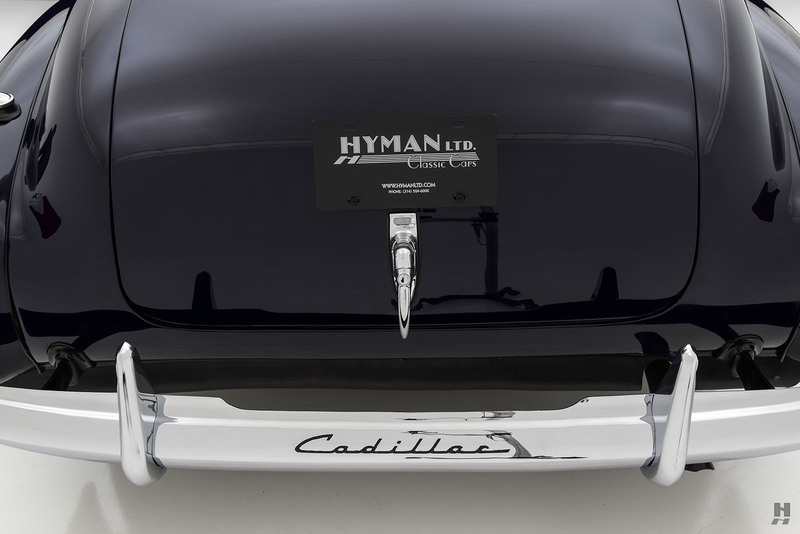 As a result, sales of the so-called “Cadillac-Fleetwood” Series 75 models comprised just 959 cars out of the annual total, with Series 90 V16 cars failing to break into triple-digits. 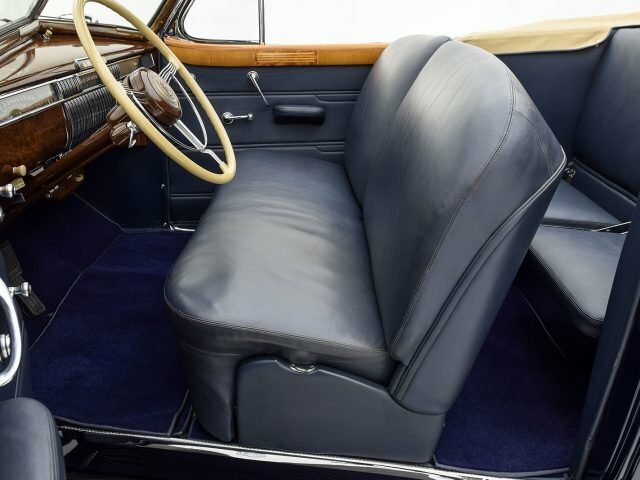 The Imperial Sedan and 5-Passenger Sedan made up the bulk of Series 75 sales, while sportier styles sold in comparatively minuscule numbers. 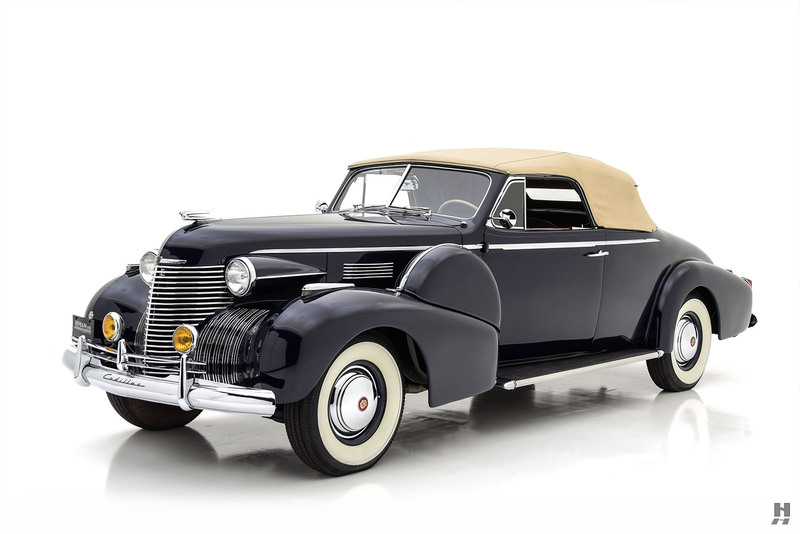 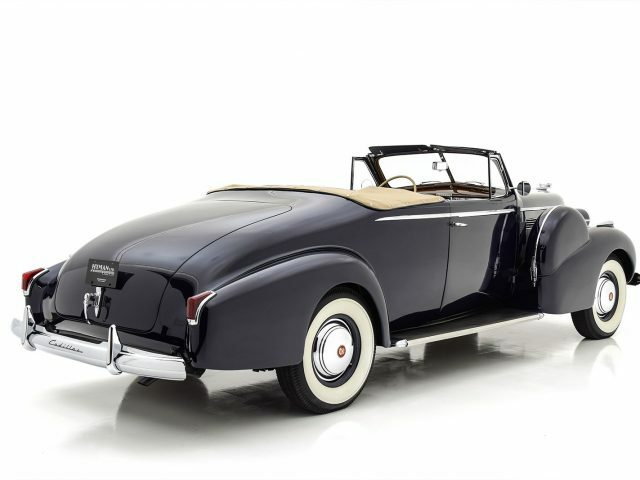 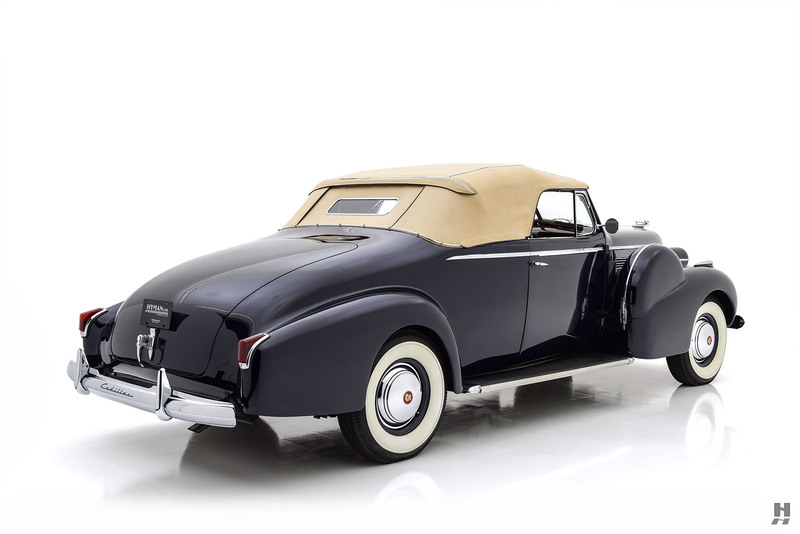 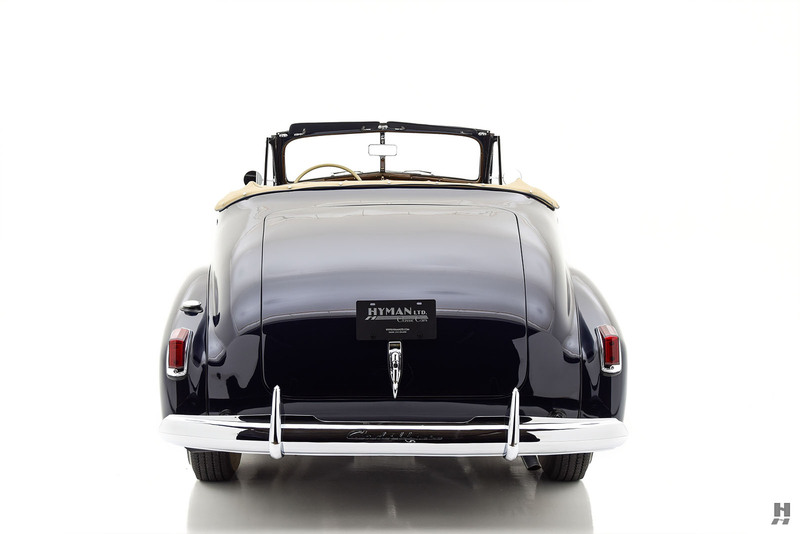 With unique styling and historical status as the last of the open, two-door coachbuilt Cadillacs, the Series 75 Convertible Coupe is a highly collectible and desirable model that remains popular with enthusiasts as much for its looks as for its outstanding road manners. 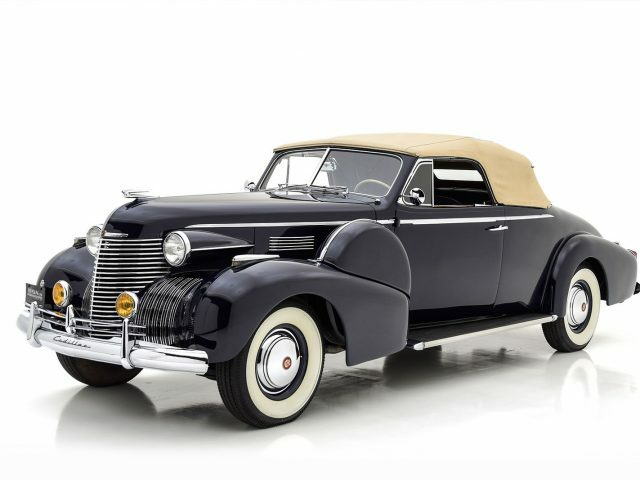 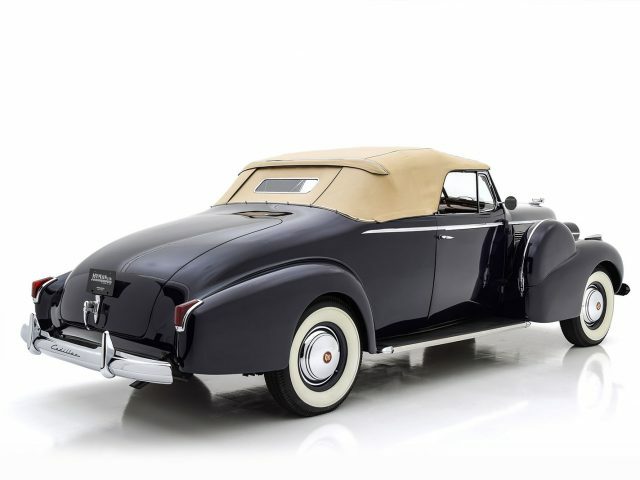 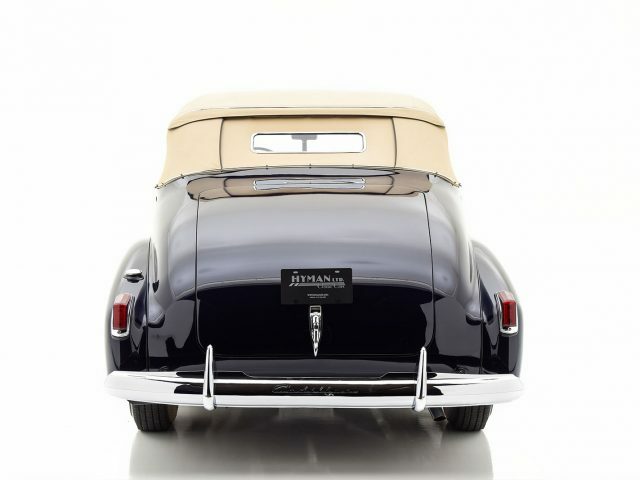 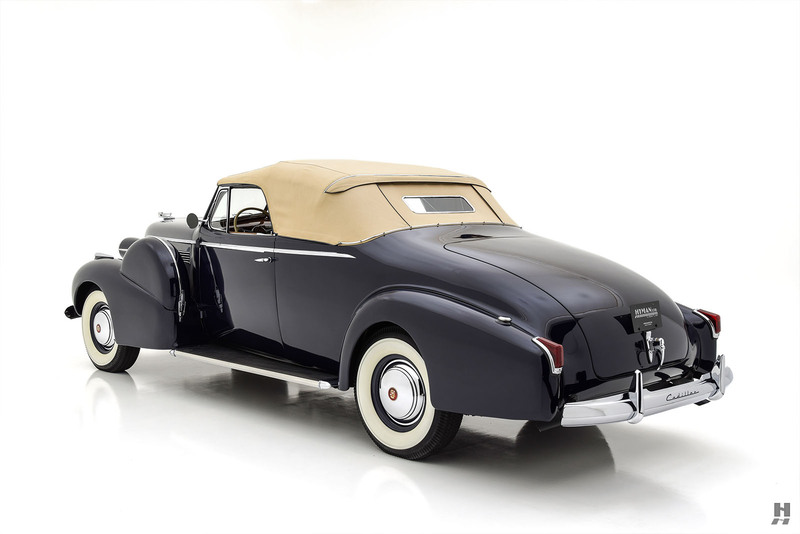 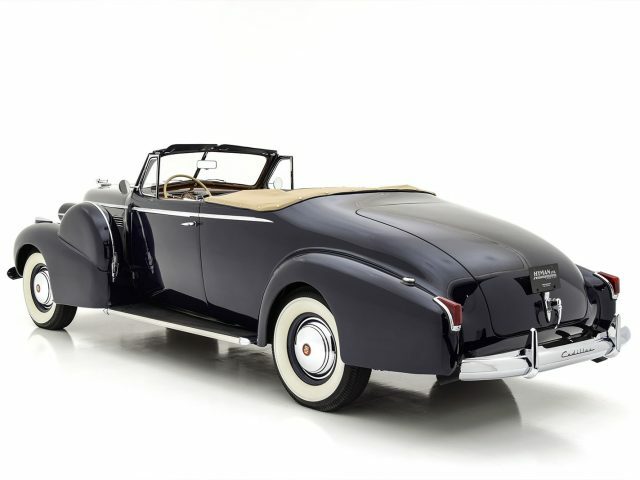 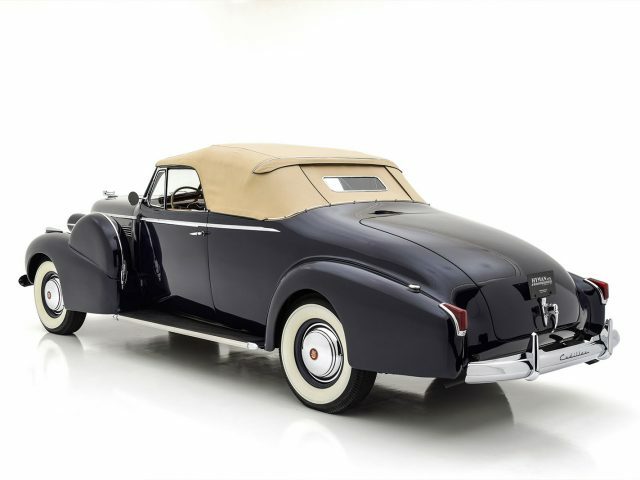 The Series 75 Fleetwood Convertible Coupe featured here is one of just 30 such examples produced in 1940. 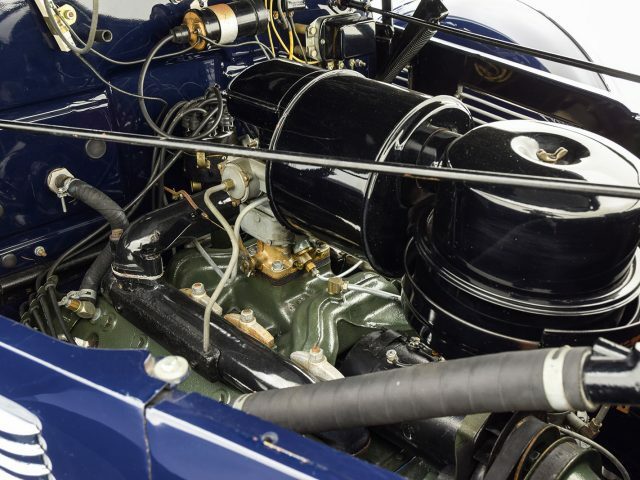 It has been in the care of several notable collectors over the years, and comes most recently from an active CCCA member and touring enthusiast. 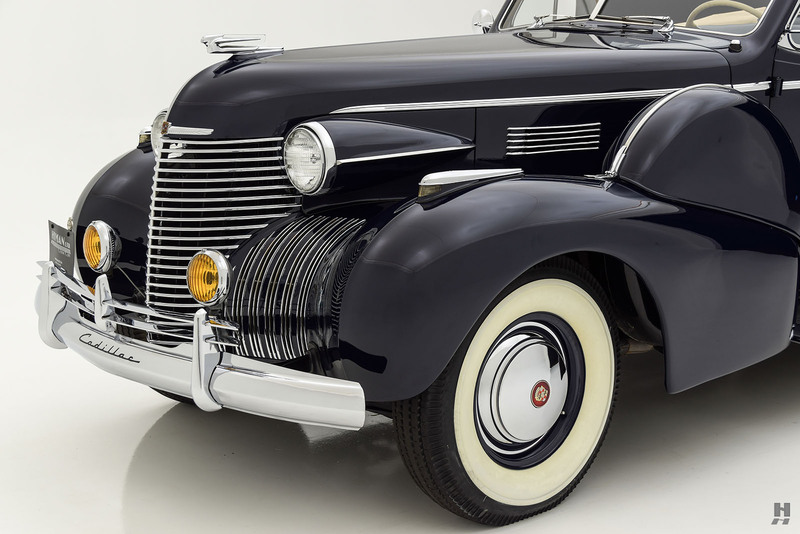 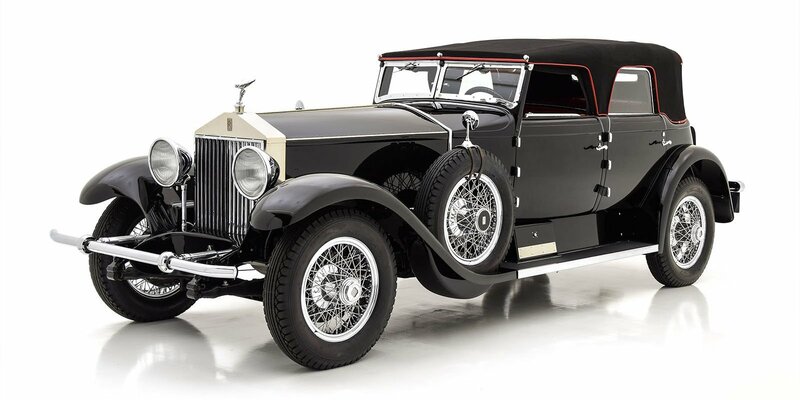 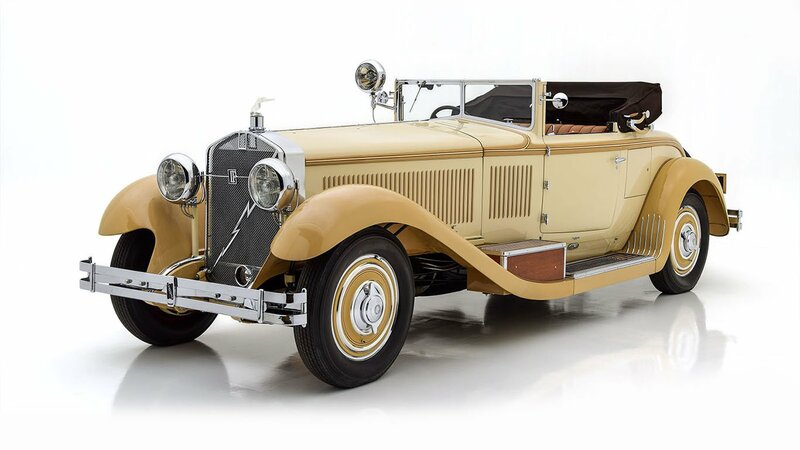 Wearing an older, high-quality restoration, this rare and highly desirable Cadillac has mellowed gently and is ideally suited for tours and casual concours events. 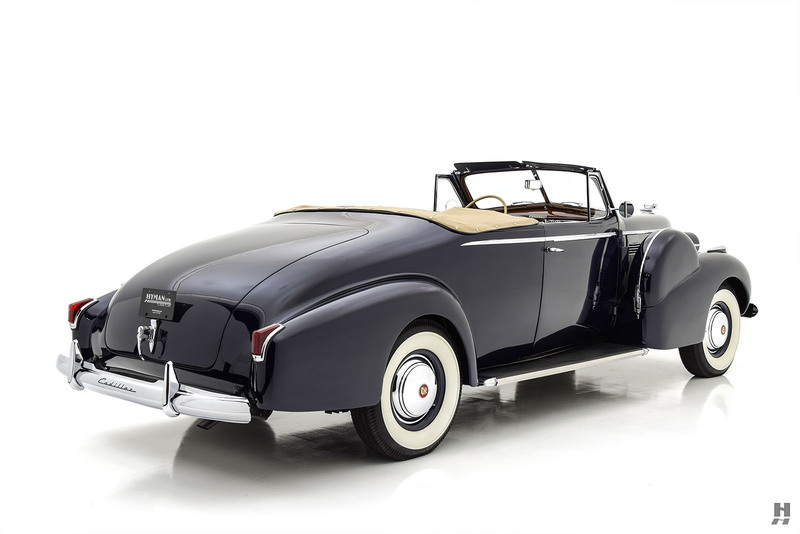 Finished in dark blue and trimmed with a beige top and blue interior, the presentation is marvelous: Elegantly proportioned, yet with an imposing presence. 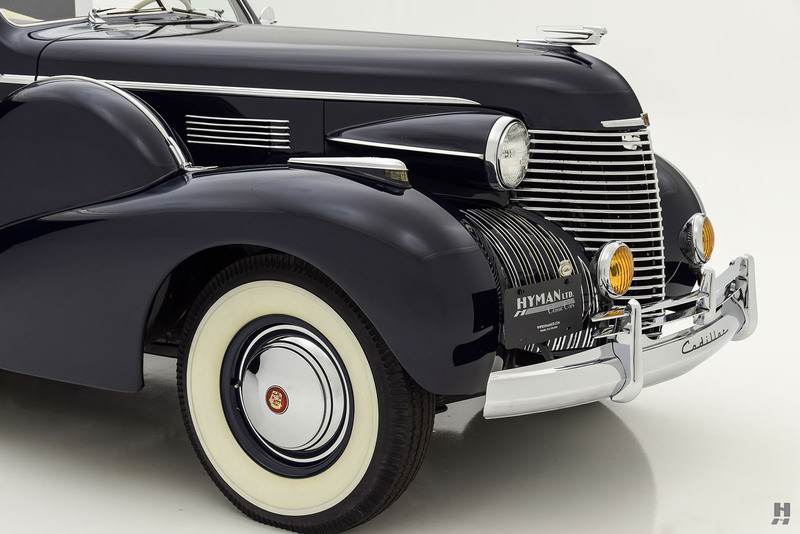 Unsurprisingly for a flagship model, this car is highly optioned, complete with side-mount spare wheels, Cadillac script bumpers, fog lamps, radio, and heater. 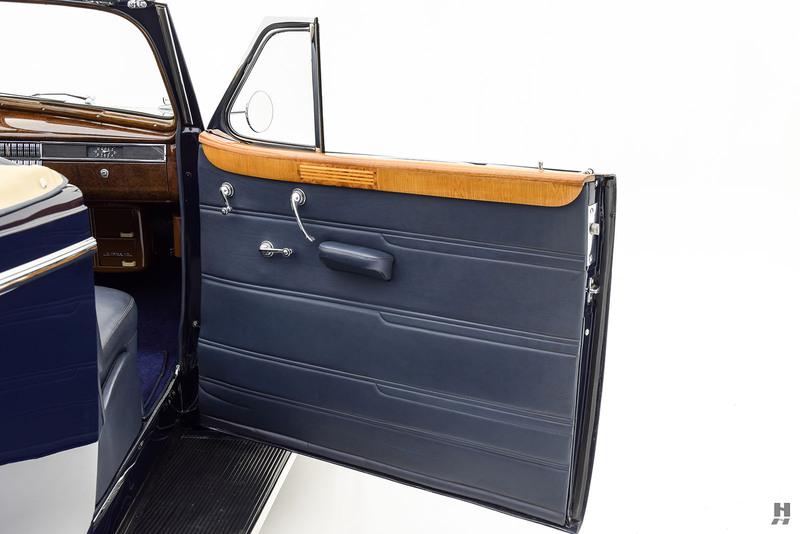 The body is in excellent order, displaying good panel fit and attractive finishing. 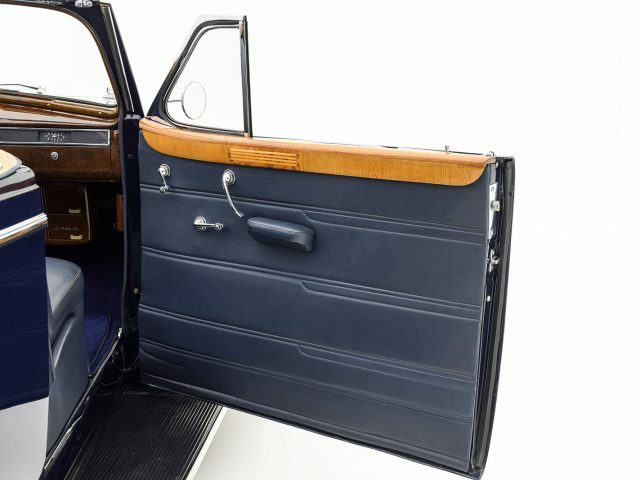 Some minor touch-ups can be found on close inspection; however, the car remains highly appealing and in outstanding order for use on tours and weekend getaways. 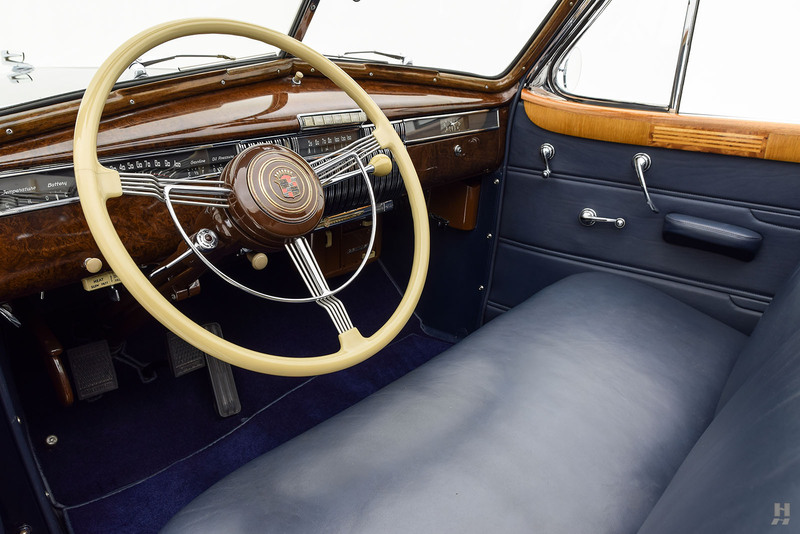 Similarly, the brightwork is in excellent condition, with a few minor imperfections found that does little to detract from this being a marvelous and beautifully-presented example. 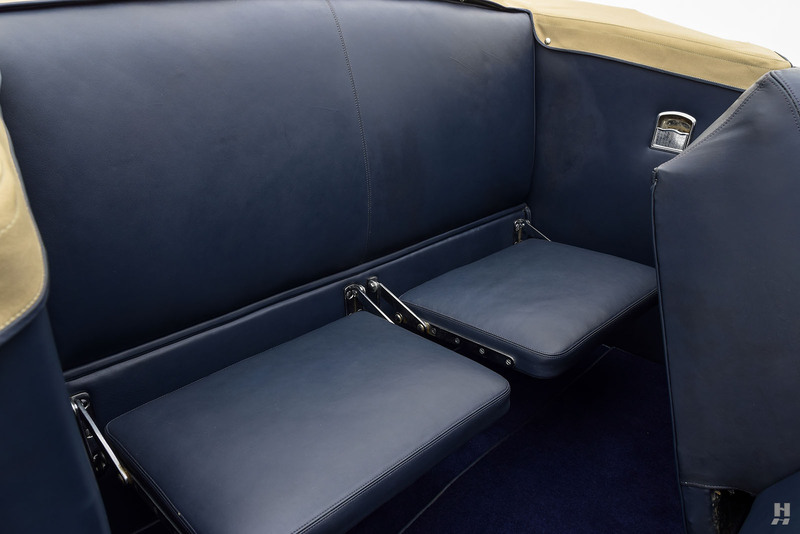 The cabin offers generous front seats, supplemented by a pair of folding jump-seats in the rear. 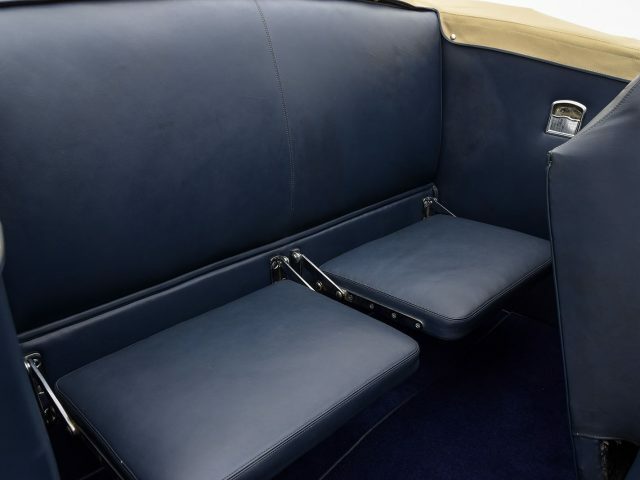 Blue leather features on the seats, door cards, and interior panels. 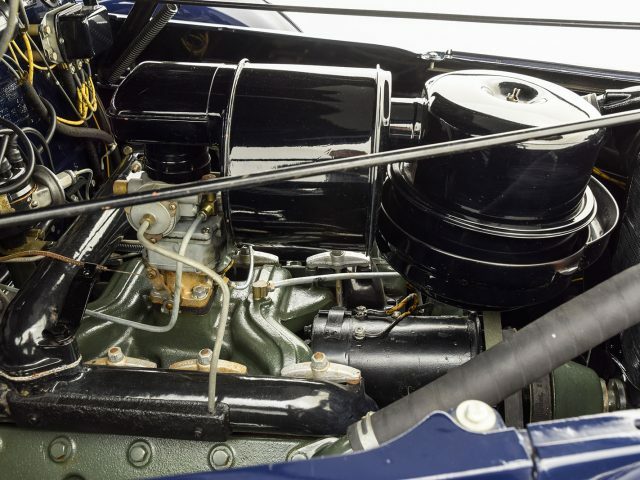 It is in very good order, appearing gently broke-in since the restoration. 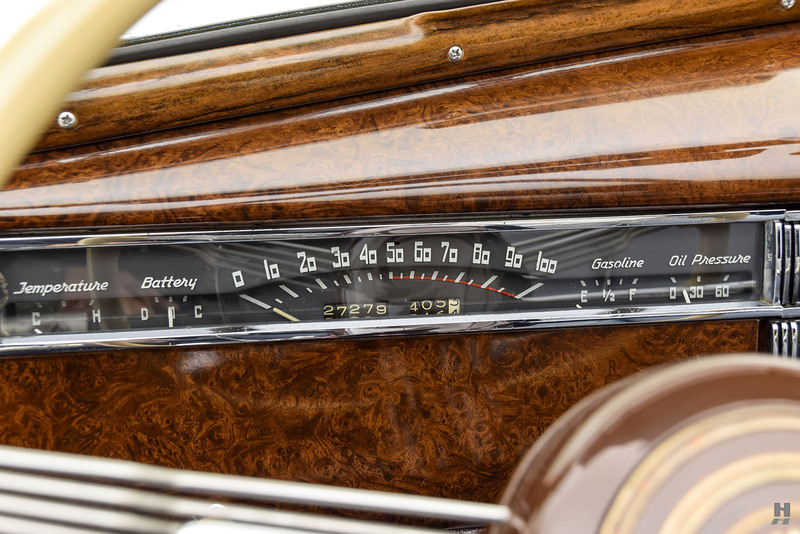 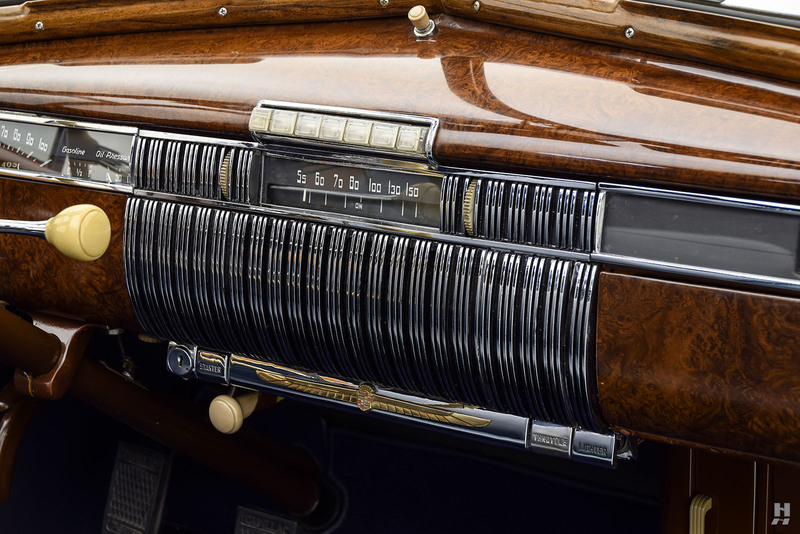 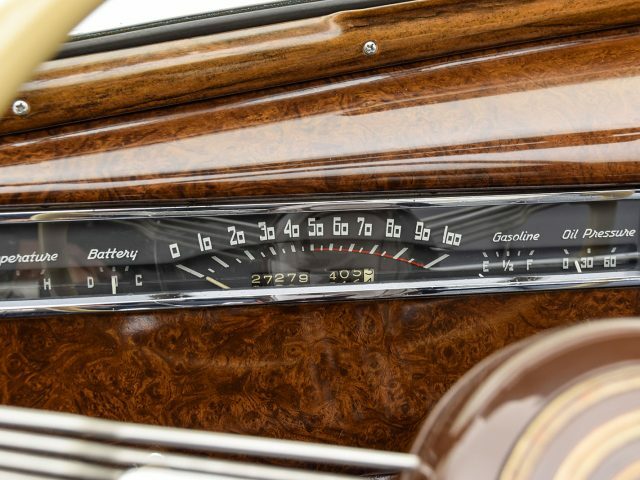 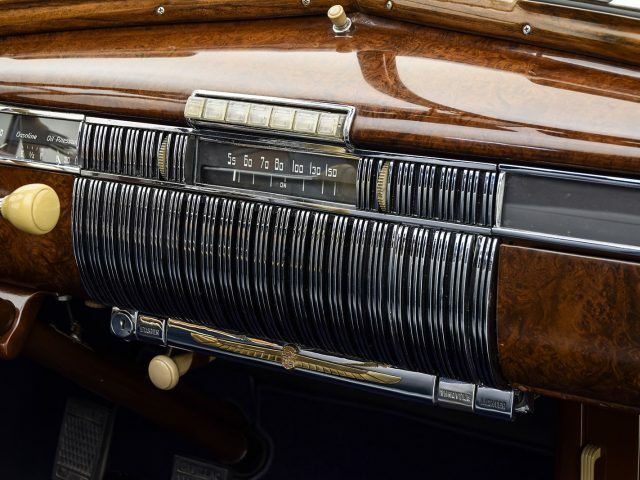 The burled walnut woodgrain dash is highlighted with a central grille that reflects the front-end treatment and houses the original radio. 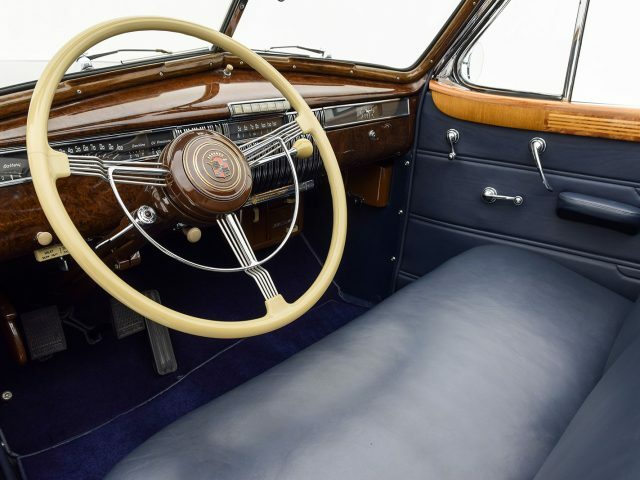 Modern refinements also include a heater/defroster unit, roll-up side glass, and a column-shifted 3-speed manual gearbox with synchromesh and overdrive. 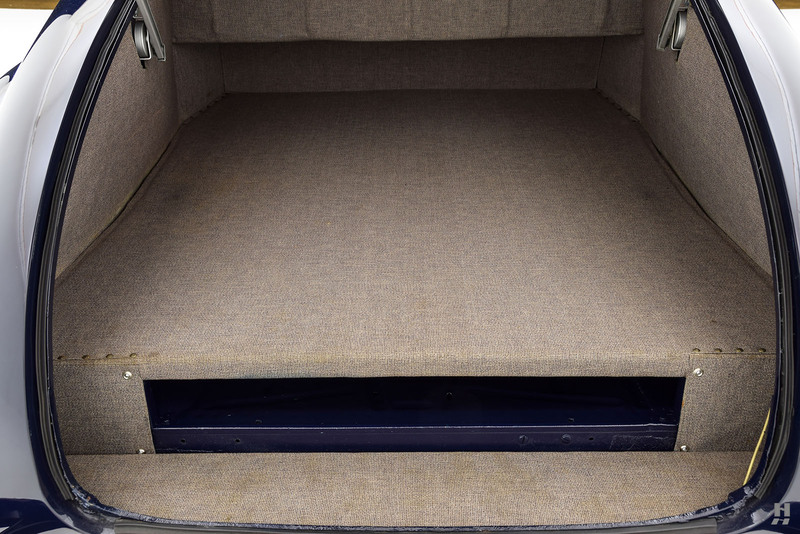 The tan canvas top is piped in blue leather, which repeats on the fitted canvas boot. 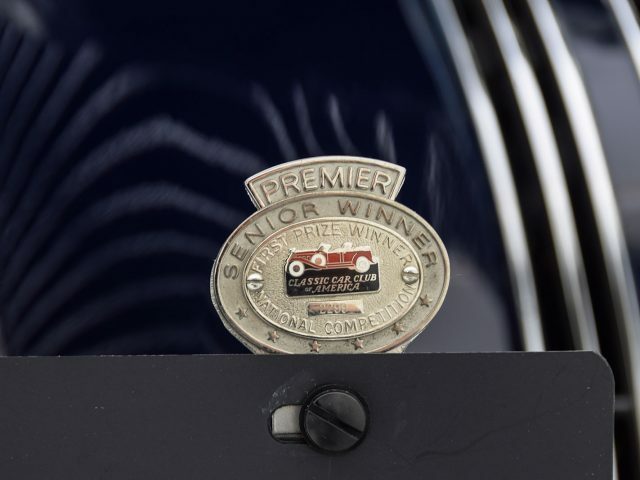 A transparent protective top cover is also included. 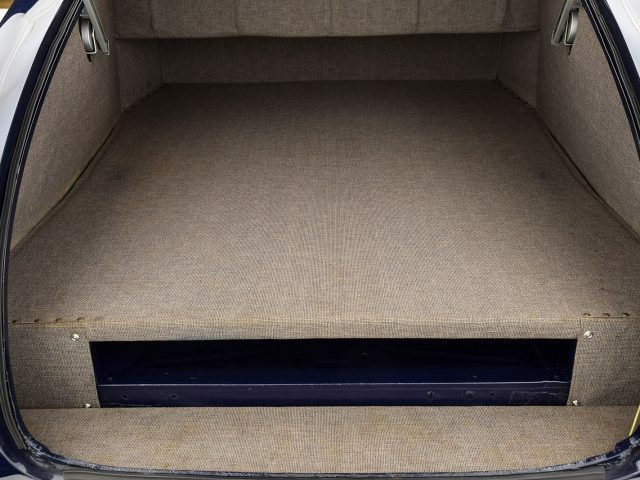 With a grand 141-inch wheelbase, the trunk is generously sized, allowing plenty of room for enough luggage to support a long-distance tour or weekend getaway. 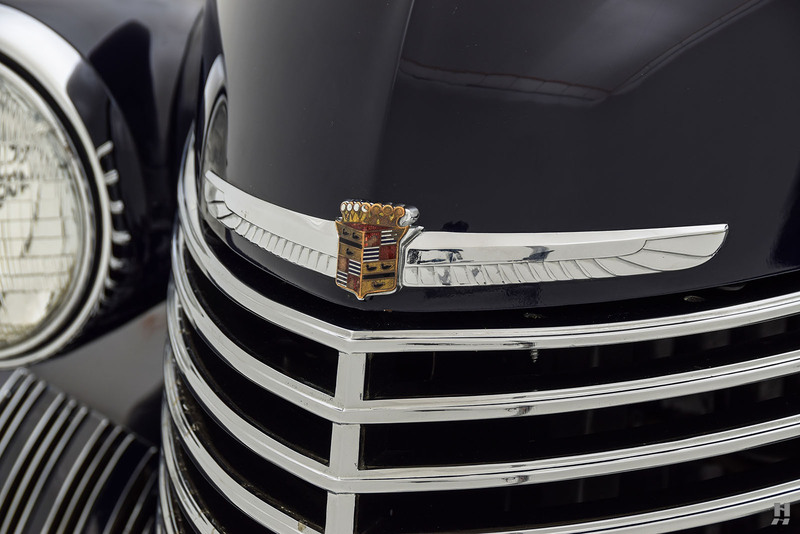 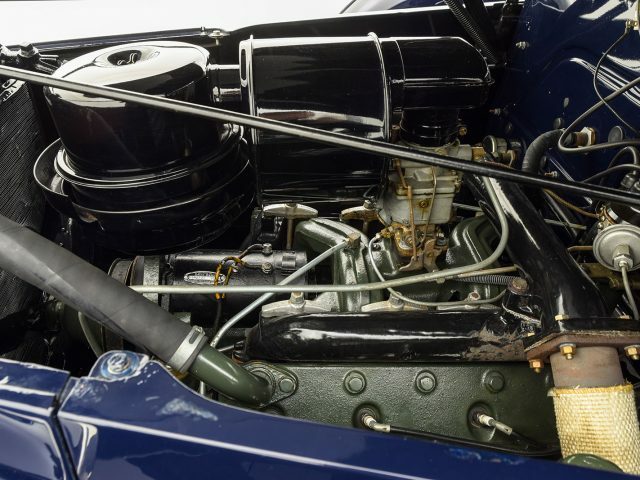 Powering the car is Cadillac’s legendary L-head V8 engine. 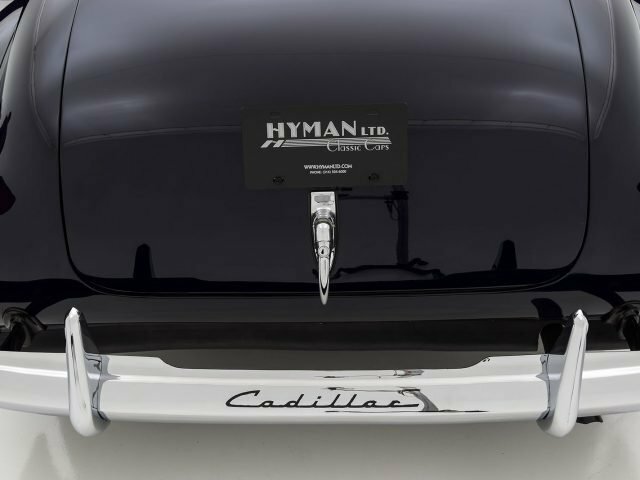 The unit displaces 346 cubic inches and produced 140 horsepower with a generous supply of torque to move the big Caddy along with relative ease. 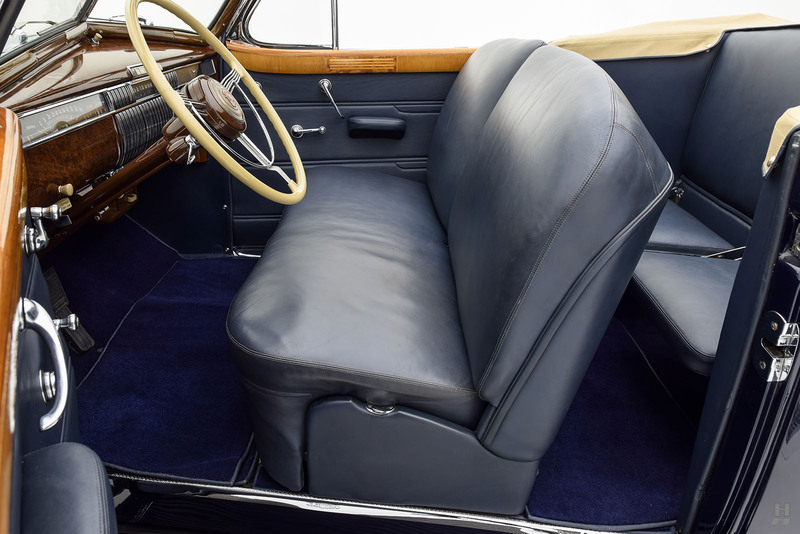 Cadillac was an early adopter of the synchromesh gearbox, which, combined with the column-mounted shifter, allows for effortless progress. 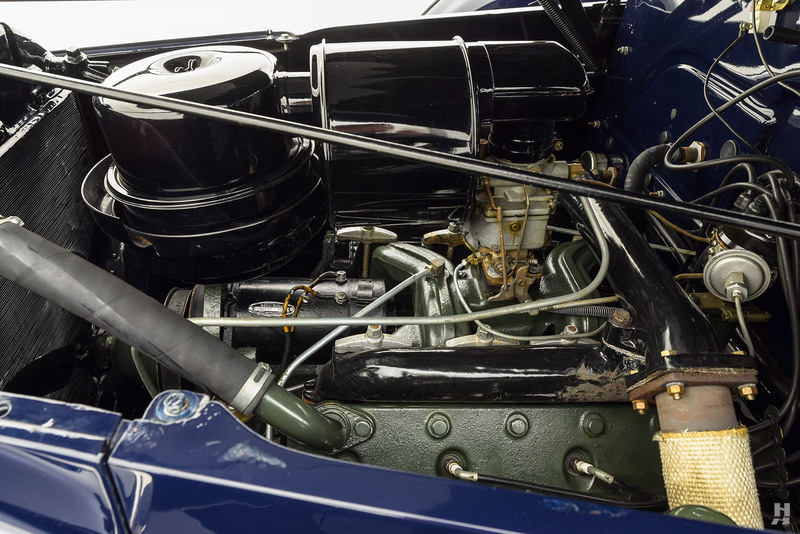 An optional overdrive further enhances this car’s long-distance ability. 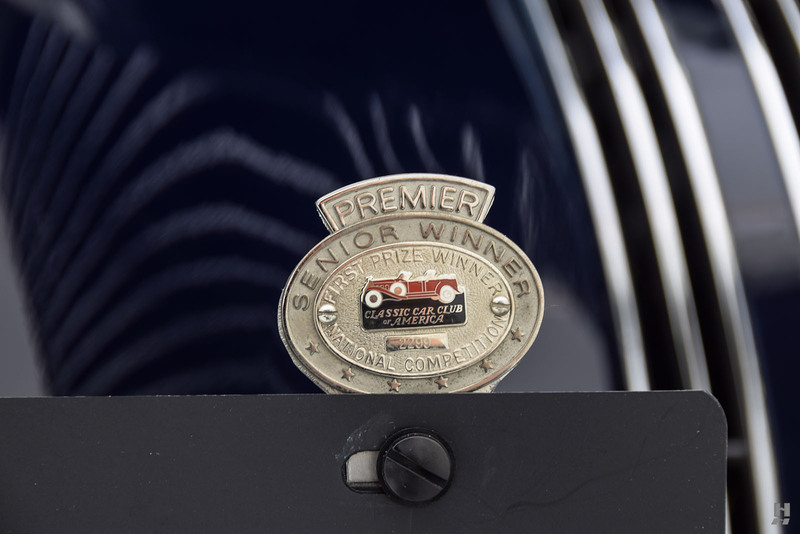 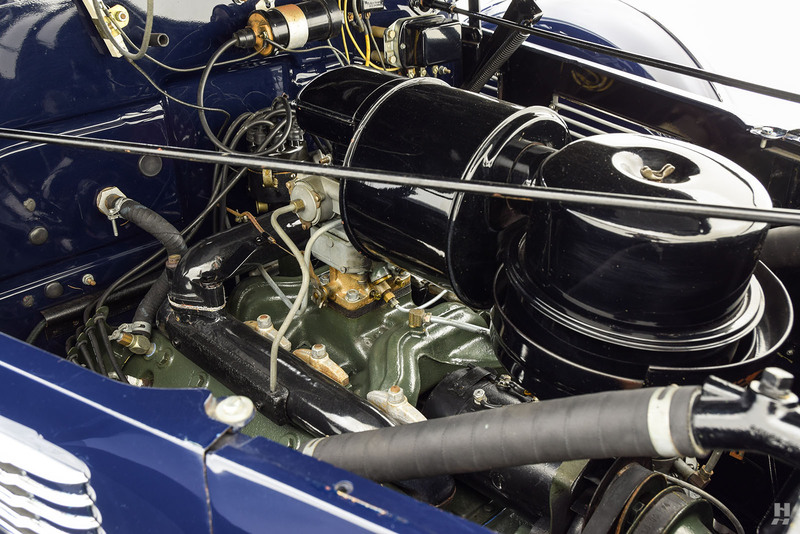 The engine is pleasingly well-detailed, with correct Cadillac green engine paint and black porcelain finish manifolds. 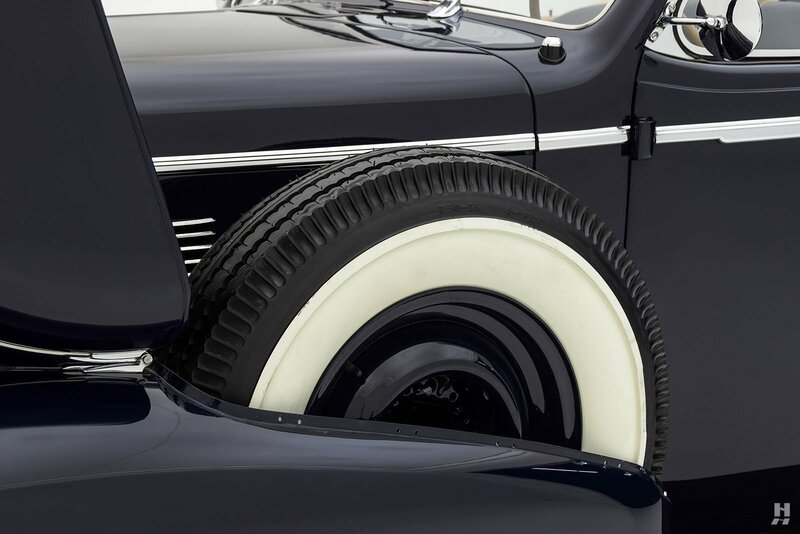 It shows signs of light and careful use, while still retaining a period-correct appearance.